In support of the National Association of Regulatory Utility Commission’s (“NARUC”) resolution supporting the Environmental Protection Agency’s (“EPA”) WaterSense “Fix-a-Leak Week”, March 20 – 26, 2017, the Hawai’i Public Utilities Commission encourages the adoption of programs and the offering of products that promote water efficiency, and to find and fix leaks to save water in our community. Leaks can account for more than 10,000 gallons of water in an average home every year—the amount of water it takes to wash 270 loads of laundry. 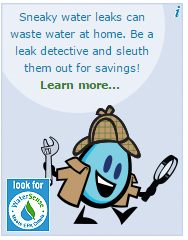 Leaks can also add an extra 10 percent to your water bill each month. While water is relatively inexpensive compared to energy, water is a finite resource worth conserving. Reducing water use can also reduce the amount of energy needed to provide this water to you, the consumer. This in turn saves on energy costs which is a powerful incentive for water and wastewater utilities to improve the efficiencies within their system. Similarly, water is needed in the production of energy, and thus a reduction in energy production may realize water savings. This is the Water-Energy Nexus.